I am available to consult in the following areas, and rates are negotiable on an hourly, daily or project basis. Event organisation: planning and overseeing corporate and special events. Classes and Demonstrations: hands-on cooking classes for small or large groups; public demonstrations for product promotions. Recipe Development: for producers, new products and promotions. I also do recipe testing and refinement, and I can create new recipes for product promotion and publication. One of my strengths is my ability to combine flavours and my in-depth technical cookery knowledge. Public Appearances, endorsements and presentations: I am an experienced public speaker and can speak knowledgeably on many food topics. 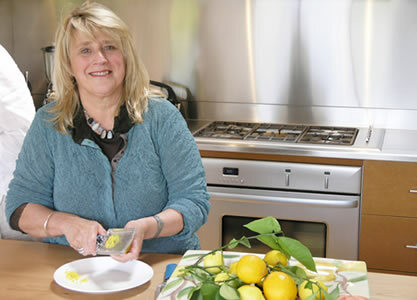 Judith has presented in Tasmania and interstate television food shows and her cookery series, What’s Cooking and Judith’s Food Notes ran for seven years. Judith has worked in Tuscany and on the Amalfi coast on two major television series, Cucina Valentina with Valentina Harris, filmed for a United Kingdom audience. Valentina Harris has written more than 20 cookery books on Italian cuisine, such as Risotto Risotto, Italia Italia, Complete Italian Cookery Course and In Tuscany. Judith has also consulted and demonstrated at the BBC Good Food Show, in London, on several occasions. One of Judith’s great joys is sharing her knowledge of food with others. She teaches Adult Education classes, has taught Master Classes at Drysdale hospitality college, and set up the Culinary Arts Centre in Sandy Bay. For many years Judith had her own cookery school, Cotswold Cuisine and restaurant, in New Norfolk. She has worked and taught with Margaret Fulton, Australia’s foremost cooking personality and Tess Mallos, writer of the best selling classic The Complete Middle East Cook Book. Judith is the Tasmanian convenor of Slow Food.